February 21-24 in the Straz Center for the Performing Art’s TECO Theater. For two decades, young readers have been enthralled by Mary Pope Osborne’s inventive award-winning Magic Tree House book series that details the adventures through time of siblings Jack and Annie. 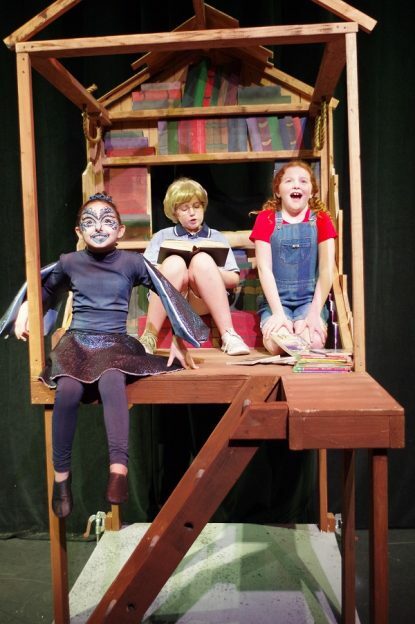 Patel Conservatory students in grades two through four perform this fantastical musical adaptation of the series’ first book, Dinosaurs Before Dark, when Jack and Annie’s tree house transports them back in time to the age of the dinosaurs. The pair courageously encounter creatures and characters in this whimsical story, where they learn that things are not always what they seem. For children, performed by children, Magic Tree House: Dinosaurs Before Dark KIDS, will be directed by Sarah Berland, with musical direction by Timothy Wilt and choreography by Katie Miesner. Magic Tree House: Dinosaurs Before Dark will be presented in TECO Theater February 21-24. Performances are Thursday and Friday at 7 p.m. and Saturday and Sunday at 1 and 4 p.m. Regularly priced tickets start at $15 and may be purchased by calling 813.229.STAR (7827) or 800.955.1045 outside Tampa Bay, in person at the Straz Center Ticket Office or online at www.strazcenter.org. Handling fees will apply. More information about the Patel Conservatory is available by calling 813.222.1040 and at www.patelconservatory.org. The accredited Patel Conservatory offers summer camps and classes in dance, music and theater for students of all ages and experience levels. Each year, the Patel Conservatory and the Straz Center’s arts education programs enrich the lives of more than 70,000 students in our classrooms, on our stages and through the community.